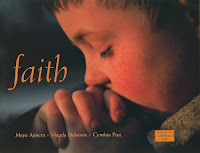 Faith by Maya Ajmera, Magda Nakassis, and Cynthia Pon. Charlesbridge, February 2009. Copy from my library. In our world, there are many faiths. I am always on the lookout for books that celebrate different cultures. The subject of religion can be a tricky one, especially for younger readers, but Faith completely fits the bill. Simple text accompanies stunning photographs showing children practicing different religions from around the world. The book celebrates our differences and reminds us that we're more alike than we are different. Pictures show children praying, visiting holy places, celebrating holidays and celebrating their faith in other ways. Religions depicted include Buddhism, Rastafarianism, Hinduism, Christianity, Judaism, Islam, and Native Americans (among others). Countries depicted include Saudi Arabia, Sri Lanka, the United States, India, Mongolia, Kenya, Guatemala, Turkey, Israel, and the United Kingdom (among many others). All the photos are captioned to tell you where they were taken and a map in the back of the book shows all the countries included in the book. The simple text is perfect for sharing with young children and there is more information at the back of the book about each section (ex. Holidays and Festivals, Food and Drink, Dress, etc.). I think this is a book that can span many ages. It would be great for starting a conversation with young children about religion and it would be an excellent springboard for older students beginning a unit on world religions or world cultures. Read more reviews at The Well-Read Child and A Patchwork of Books. And you don't have to take our word for it. You can access a preview of the book on Google Books. Happy Nonfiction Monday! Tales from the Rushmore Kid has the roundup this week. I was such a fan of this book. Great photos, great text, simple-yet-effective!